The following text by Professor William Montgomery Watt has been scanned and placed on the web by me, Alastair McIntosh of Scotland’s Centre for Human Ecology. I have done this because I am regularly contacted by scholars about the interview that Bashir Maan and I undertook with him during his 90th year in 1999 (see http://www.alastairmcintosh.com/articles/2000_watt.htm ) Prof Watt give me a reprint his article about women and Islam after it first came out in 1991 and he had made a presentation about it at a conference in Scotland. I believe this paper has a relevance to contemporary understanding of the Islamic world that merits being made available on the internet. I telephoned Professor Watt’s residence near Edinburgh, Scotland, today (27 May 2005) but was told by his daughter, Ann Watt, that on account of his advanced age he is no longer involved with intellectual work. She said he spends most of his time between meals doing crosswords. He would probably no longer remember who I was as his memory has mostly gone, but the crosswords demonstrate that parts of his immense intellect are still with him. I last saw him about 3 years ago when I gave a talk to his Family Group in the Iona Community. He was advanced in age and manifestly infirm. I suspect that he was able to absorb very little from what I said, though it was wonderful to be in his presence. [Ps. On 16 July 2005 I received an email from Ann Watt adding: "My father spent several months in hospital last year, and there is the occasional scare when he gets taken in again, but he is on a fairly even keel. He has certainly lost interest in a lot of things and his memory is fairly selective." Please note that I have had little time to correct the text for scanning errors in the text that follows. I am particularly aware that the accents on Arabic words have frequently been picked up wrongly, but I hope that Arabic readers will be able to make their own adjustments where necessary. I notice that Prof Watt often precedes a passage with unclear meaning with a question mark [? ], so please do not confuse these with scanning errors. I apologise for this limitation in offering here for scholars and people of goodwill an important insight into Professor Watt’s views on a matter that is of great significance in today’s world. Speaking as a Quaker with with Christian roots, what this paper did for me was to suggest that early Islam was profoundly concerned with women’s rights and wellbeing. Allahu Akbar! … Alastair McIntosh. 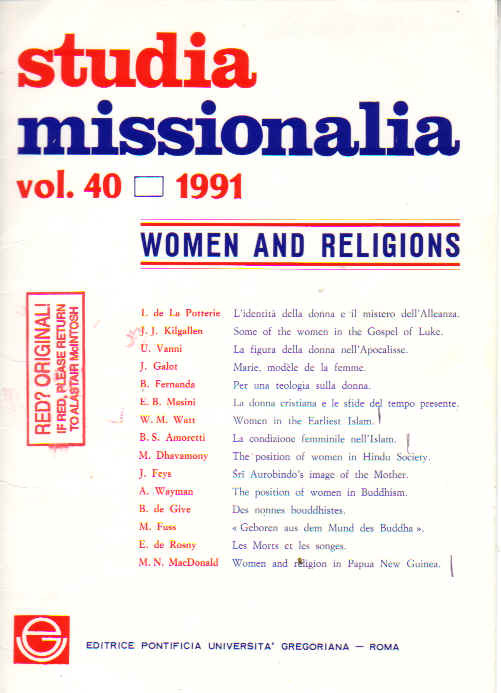 Originally published in studia missionalia, Vol. 40, 1991, pp. 162-173, Editrice Pontificia Universita Gregoriana, Roma. Islam is still in many ways a man’s religion, but the position of women was improved at various points by Muham­mad and the new religion he proclaimed. To understand the early stages of this improvement it is necessary to know something about the position of women in Arabia before Muhammad’s time. For this there is a considerable amount of material in Arabic, but to get the full picture requires further study by competent anthropologists. In my book Muhammad at Medina, published in 1956, I did my best, as a non-anthropologist, to deal with this material. So far as I know, no anthropologist has since studied it, and what I present here is a summary of my own findings. It has often been supposed that the provision of Islamic law by which a Muslim man may have four wives was a restriction of a previously unlimited polygyny. One or two cases are mentioned of men having up to ten wives, but it is not clear within what social system this occurred. The verse of the Qur,’ãn on which the restriction is based appears to be en­couraging men to have more than one wife: “If you are afraid that you cannot act with equity in respect of orphans, then marry those of the women who seem good to you, twos, threes, fours; and if you are afraid that you will not act justly (towards several wives), then one (only), or what your right hands possess (sc. slaves)” (Sura 4.3). To understand this verse it is necessary to attempt to give some account of the relations between the sexes in pre-Islamic Arabia. The basic fact appears to be that in most parts of Arabia the social system was based almost exclusively on matrilineal kinship, that is, kinship where only descent from mother was considered. This did not mean matriarchy or rule by women, however. There seem to have been extended families of people related matrilineally, but the control of this family and its property would be in the hands of a uterine brother of the senior woman, and would pass from him to her son. Early Muslim scholars have preserved accounts of the marital arrangements associated with this social system. The two main forms seem to have been what may be called limited and unlimited polyandry. Thus it was a case of a woman having a limited or unlimited number of “husbands” and not of a man having several wives. In the case of limited polyandry, when a woman gave birth to a child, she summoned her male sexual partners (who were less than ten), and in front of them declared that a particular one was father of the child; and the man was not allowed to deny this. The unlimited polyandry seems hardly to have differed from prostitution, but there may have been restraints of which we are not informed. In these cases of polyandry the “marriage” seems to have been uxorilocal, that is, it took place in the house where the woman lived, and the man was said to “visit” her. The men, of course, may well have made such “visits” to several women. It further appears, however, that in some parts of Arabia, notably in Mecca, the matrilineal system was in process of being replaced by a patrilineal one. This interest in paternity is probably connected with the increasing commercial prosperity in Mecca and the accompanying growth of individualism. Men who were amassing considerable personal wealth wanted to be sure that this would be inherited by their own actual sons and not simply by an extended family of their sisters’ sons. One of the essential changes made by Islam was to insist that a woman should have sexual relations with only one man at a time. Divorce or change of partner was relatively easy, especially for the man, but it was obligatory for a woman, before having another sexual partner, to observe a waiting-period (‘idda) to ensure that she was not pregnant. It was not easy, of course, to effect such a sweeping change all at once, and for a time a distinction seems to have been made between women who observed the waiting-period and those who did not. Along with this change went a change from uxorilocal to virilocal marriage, that is, it was now the woman who went to a house provided by the man. Muhammad’s wives each had a separate apartment, but these were round a central courtyard in what was essentially his house, though it also served as mosque. The verse of the Qur’än quoted above is said to have been revealed after the battle of Uhud in 625 in which many Muslims had been killed, leaving widows to be provided for. In the circumstances of Medina at the time many of these widows could easily have sunk back into the polyandry which had been prevalent there; and it was doubtless for this reason that Muslim men were encouraged to form households in which there were several women partnered only to the head of the household. The Qur’än also contains various other regulations which seem to be designed to prevent the men in charge of matrilineal households from treating the women under them unfairly. In the sphere of marriage and family relations Muhammad effected a profound and far-reaching reorganization of the structure of society. Before his time new individualistic tendencies were certainly present, but their presence was leading more to a breakdown of the old structure than to the building up of a new one. Muhammad’s essential work here was to use these individualistic tendencies in the raising of a new structure. The customs and practices of the communal (tribal) stage of society, to vary the metaphor, had suffered shipwreck; Muhammad salvaged what was valuable from them, and carried it over to the new individualistic society. In this way he produced a family structure that in many respects has proved attrac­tive and satisfactory for societies emerging from the communal stage and passing into an individualistic one. Both by European Christian standards and by those of Islam, many of the old practices were immoral, and Muhammad’s reorganization was therefore a moral adv­ance (p. 289). In this restructuring of society there were changes in the position of women, some for the better, some perhaps for the worse, though of course we do not really know how women fared in the polyandric system. On the whole, however, it would seem that women benefited from the changes and were given greater security, especially since the change from a communal society to a more individualistic one was inevitable. The following are the main Qur’anic passages dealing with marital matters. The translation is my own, but for the most part it follows the interpretations in the translations of Marma­duke Pickthall and George Sale. The former was himself a Muslim who consulted Egyptian Muslim scholars, while the latter followed closely the interpretations of the standard Muslim commentator, al-Baydawi. It should be noted, howev­er, that the commentators were interested in showing how the Qur’an justified contemporary Muslim practice, and not in understanding what the verses meant to the first Muslims. In sections 4 and 5 I have tried to show what some passages might mean to persons just emerging from a social system based on matriliny, as described in the article. It seemed helpful to transliterate certain key words rather than translate. To the reader it will soon become clear that many passages are obscure and capable of different interpretations, but it is not feasible here to enter into a discussion of such questions. Words in brackets are additions to the Arabic text; in some cases they are implicit in it, as in the gender of pronouns, while in other cases they seemed needed to make the meaning clear. If you are afraid that you cannot act with equity in respect of orphans, then marry those of the women who seem good to you, twos, threes, fours; and if you are afraid that you will not act justly (towards several wives), then one (only), or what your right hands possess (sc. slaves). Give the women (you marry) their marriage portions (saduqat) as a gift; but if the voluntarily remit to you any part of it, enjoy that wit satisfaction and advantage. (Sura 4.3,4). Do not marry polytheistic (women) until they believe. A believing slave-girl is better than a polytheistic (woman), even though (the latter) pleases you. Do not give (your daughters) in marriage to polytheists until (these) believe; a believing slave is better than a polytheist, even though (the latter) pleases you. These invite to Hell, but God invites to Paradise and forgive­ness by his grace. He makes his signs (or revelations) to people, so that they may be admonished. They ask you (Muhammad) about menstruation. Say: It is an uncleanness, so keep apart from women during menstrua­tion, and do not go near them until they are cleansed. When they are cleansed, go in to them in the way God commanded; God loves those turning to him, and he loves the cleanly. Your wives are a field for you (to cultivate). Go in to your field as you will, but send (good deeds) before you (profitable) to yourselves. Fear God and know that (one day) you will meet him (2.221-3’). Mothers suckle their children for two full years for him (the father) who wants to complete the suckling. (Incumbent on) him to whom the child is born is the feeding and clothing of them (the women) in fairness. No person shall be burdened beyond his ability. A mother shall not be made to suffer for her child, nor he to whom the child is born for his child. Incumbent on the heir (of the father) is the like of that. If the two (parents) decide on weaning by mutual agreement and counsel, it is no sin for the two. If you want a wet-nurse for your children, it is no sin for you provided you pay what you offer (her) in fairness. Fear God and know that God is seeing what you do. Those of you who die and leave wives, let (the wives) keep a waiting-time (tarabbus) apart by themselves for four months and ten (days). When they reach their term (ajal, sc. the end of the waiting-period) it is no sin for you whatever they do with themselves in fairness. God is informed of what you do. It is no sin for you (either) to make public your betrothal of women (? during their waiting-time) or to conceal (that) in yourselves. God knows you will remember them. Make no promises to them privately unless in fair words, and do not decide on making the (actual) marriage until the (period) written has reached its term. Know that God knows what is in yourselves so beware of him; and know that he is forgiving, clement (2.233-5). 0 believers, it is not lawful for you to inherit against their will the women (of your deceased kinsmen), nor to hinder them (from marrying others) so that you may take away part of what you have given them (as dowry? ), unless they are guilty of open indecency (fahisha); but associate with them kindly; if you hate them, it may happen that you are hating something in which God has placed much good (4.19). Say to the believing (women) that they lower their eyes and preserve their private parts, and that they do not display their adornment except what (normally) appears: that they draw their veils over their bosoms, and do not display their adornment except to their husbonds or their fathers or their husbands’ fathers or their sons or their husbands’ sons or their brothers or their brothers’ sons or their sisters’ sons or their women or what their right hands possess (sc. slaves) or male attendants who lack vigour or children who do not distinguish women’s nakedness. Let them not stamp with their feet so that what is concealed of their adornment is revealed. Turn together to God, 0 believers, so that you may prosper. Marry those of you who are solitary (or single? ), and those of your men and women slaves who are upright; if they are poor, God will enrich them of his abundance. God is of ample means and knowing. Let those who cannot find a marriage remain chaste until God enriches them of his abundance (24.31-3). Let them (your wives) dwell where you dwell, according to your means. Do not be hard on them so that you straiten life for them. If they are pregnant, spend on them (what is needful) until they are delivered of their burden. If they suckle (their children) for you, give them their hires (ujur) and consult together fairly. If there are difficulties between you, and another (woman) suckles for him (the father), let him with plenty spend of his plenty, and let him whose provision is limited spend of what God has given him. After hardship God will give ease (65.6,7). Do not marry those women your fathers married, except what has already happened, for this is indecency (fahisha) and abomination (maqt) and an evil way. Forbidden to you are your mothers, your daughters, your sisters, your father’s sisters, your mother’s sisters, your brother’s daughters, your sister’s daughters, your foster-mother, your foster-sisters, your wives’ mothers, your step­daughters who are under your care (born) oTf your wives to whom you have gone in — but if you have not gone in to them, it is no sin for you (to marry their daughters) — and the wives of your sons who are from your loins. (You are also forbidden) to have two sisters together, except what has already happened. God is forgiving, merciful (4.22,23). (As pointed out in the article, one of the great innovations of Qur’anic law was the insistence that between two husbands a woman must observe a waiting-period (tarabbus, ‘idda); the end of this period was the “term” or ajal). For those who forswear their wives (or vow to abstain from them) a waiting-time (tarabbus) of four months (is prescribed); but if they change their mind, God is forgiving merciful. If they decide on divorce, God is hearing, knowing. The divorced (women) shall observe a waiting-time of three (monthly) courses. It is not lawful for them to conceal what God has created in their wombs (sc. a pregnancy), if they believe in God and the Last Day. Their husbands would do better in that (case) to take them back, if they (the husbands) want a reconciliation. They (the women) have (rights) similar to those (of men) over them in fairness; but the men have a superior degree to them. God is mighty, wise. Divorce is (?must be pronounced) twice; then (a woman must be) retained fairly or released in kindness. It is not lawful for you to take back anything of what you gave them, except when both fear that they cannot observe the limits (set by) God. If you fear that the two will not observe the limits (set by) God, there is no sin for the two in (the woman) redeeming herself. These are the limits (set by) God. Do not transgress them, for those who transgress the limits (set by) God, these are the wrongdoers. If he divorces her (the third time), she shall not be lawful afterwards for him (to marry) until she marries a husband other than he. If he (the other husband) divorces her, it is no sin for the two (the woman and the first husband) to return to each other, if they think they can observe the limits (set by) God. These are the limits (set by) God; he makes them clear to people with knowledge. When you have divorced women and they have reached their terms, do not hinder them from marrying their (new) husbands, if they agree between them fairly. This is in admoni­tion to him of you who believes in God and the Last Day. This is more righteous for you and purer. God knows and you do not know (2.226-32). It is no sin for you to divorce the women when you have not yet touched them and have not appointed a dowry (farida) for them. Provide for them fairly, the rich according to his means and the straitened according to his means. (This is) a duty for the muhsinin (men observing strict marriage rules). If you divorce them before touching them, but have appointed for them a dowry, then (give) half of what you appointed, unless (the women) forego (it) or he in whose hand is the marriage contract foregoes (it). To forego (? the whole) is nearer to piety. Forget not liberality among yourselves; God is the seer of what you do (2.236, 237). If you want to replace one wife by (another) wife and (if) you have given one of them a (large) sum of money, take nothing from it; would you take it by slandering (her) and openly wronging (her)? How can you take it, since one of you has gone into the other, and they (the women) have received from you a firm pledge? (4.20, 21). O you who believe, when you marry believing women and then divorce them before touching them, there is no waiting-period (‘idda) for you to fulfil towards them; but provide for them and dismiss them handsomely (33.48). O prophet, when you (men) divorce women, divorce them at their ‘idda, and reckon the ‘idda (exactly). Fear God, your Lord. Do not expel them from their houses and do not let them go away unless they have committed a manifest indecen­cy (fahisha). These are the statutes of God, and he who transgresses God’s statutes has wronged himself. You do not know whether God will bring about some new thing after this. When they have reached their term (ajal) (either), retain them fairly or part from them fairly. Call to witness two just men among you, and bear witness (as) before God. This is an admonition for him who believes in God and the Last Day. For him who fears God, God will appoint a way out (or a happy issue), and will give him provision from where he did not expect (it). He who trusts in God — (God) is his sufficiency. God is attaining his purpose (amr). God has fixed for every­thing its period. For those of your wives who despair of their courses, if you are in doubt, their ‘idda is three months, as it is for those who have not had their courses. For pregnant women their term (ajal) is when they are delivered of their burden. To him who fears God (God) will make his command easy (65.1-4). (It would clearly have been impossible to change within the space of a year or two from the earlier systems of polyandry to one in which all women observed the waiting-period. In the following verses tahassun is almost certainly a technical term for observing the waiting-period; for the men who do so the corresponding participial term is muhsinin and for the women either muhsinãt or muhsanat, where the latter, being passive, would indicate that they were made to do it. The participial forms for those following the old customs and not observing the waiting-period are musafihin and musafihat, while the akhdãn are the marital partners of such women). Also (forbidden to you are) women who are muhsanat, except what your right hands shall possess (sc. slaves); (this is) an ordinance for you from God. Lawful for you is what is beyond that, to seek with your wealth, but muhsinin, not musafihin. For what you enjoy from them (the women) give them their hires (ujür) dutifully. There is no sin in what you agree upon mutually after what is due. God is knowing, wise. Whoever of you cannot afford to marry believing muhsa­nat, (let him marry) what your right hands possess of your believing fatayat; God well knows your faith. (You are) one from the other; so marry them with the consent of their people (ahl), and give them their hires (ujur) fairly (they being), muhsanat, not musafihat, and not taking akhdãn. If when they observe the waiting-period they commit indecency (fãhisha), they are liable for half the punishment of the muhsanat. This (permission) is for him of you who fears sinning; but if you are patient (and do not marry), that is better for you. God is forgiving, merciful (4.24, 25). Today there are made lawful for you the good things; and the food of those (before you) given the scripture is lawful for you, and your food is lawful for them. (Also lawful for you) are the muhsanãt of the believing (sc. Muslim) women and the muhsanãt of those given the scripture before you, provided you give them their hires (ujür) (and you are) muhsinin, not musafihin, and not taking akhdãn (5.5). Do not compel your fatayat to bigha’ if they want tahassun, in order that you may seek the advantage of this present life. If anyone compels them, God is forgiving and merciful (to such women) after their being compelled (24.33 pert). (It is difficult to know what precisely is meant by “inde­cency” or fahisha. It might have been relapse into some of the old practices after observance of the waiting-period had been generally accepted, or it might have been something else; bigha (in 24.33 above) is also obscure. Again it is difficult to know what precisely is meant by “adulteress” and “adulterer” (zaniya, zani) against the background of polyandry, but the fault appears to be more serious than a mere return to old customs). (For) those of your women who are guilty of indecency (fahisha), call four of you to witness against them; if they witness (to the truth of the allegation), then confine the women in the houses until death comes to them, or until God provides a way (of escape). If two of you are guilty of that, punish them both; but if they repent and do well, let them alone; God is relenting and merciful. Forgiveness is only (incumbent) on God towards those who do evil ignorantly and then repent speedily; to these God relents, and God is knowing, wise (4.15-17). The adulteress and the adulterer (zãniya, zani) — scourge each of them with a hundred stripes. Let not pity for the two keep you from (executing) God’s judgement, if you believe in God and the Last Day. Let a group of the believers witness the punishment. The adulterer shall not marry other than an adulteress or a polytheistic (woman), and the adulteress none shall marry other than an adulterer or a polytheist. That (form of marriage) is forbidden to the believers (24.2,3). (In the treaty of al-Hudaybiya between Muhammad and the Meccans in 628 he is said to have agreed to send back to Mecca any individuals who came to him in Medina professing Islam. This was probably intended to apply to junior members of clans and clients. The following verse exempts believing women from being sent back and makes alternative arrange­ments). O you who believe, when believing women come to you as emigrants, examine them; God knows best their faith. If you know them (to be genuine) believers, do not send them back to the unbelievers. They are not lawful for them (the unbelievers) and (the unbelievers) are not lawful for (these women); but give (the unbelievers) what they have spent. It is no sin for you to marry (these women) if you give them their hires (ujur). Do not retain the ties of unbelieving women (? prevent them leaving you), but demand what you have spent, and let them (? unbelieving men) demand what they have spent. That is the judgement of God judging between you. God is knowing, wise. If any of your wives escapes from you to the unbelievers, and then you have your turn (? of triumph), give to those whose wives have gone away the like of what they have spent. Fear God in whom you are believers (60.10,11). (The following verses, indicating Muhammad’s special marital privileges, have given rise to much discussion of the precise meaning of some phrases, but it is here presented as it stands. There are several other passages dealing with relations between Muhammad arid his wives). O Prophet, we have made lawful for you your wives to whom you have given their hires (ujür), and what your right hand possesses of what God has given you as war-booty, and the daughters of your paternal uncle, the daughters of your paternal aunts, the daughters of your maternal uncle and the daughters of ydur maternal aunts, who have migrated with you, and a believing woman if she gives herself to the Prophet and the Prophet wants to seek her in marriage, something specially for you and not for the believers. We know what we have prescribed for them in respect of their wives and what their right hands possess, so that you (Muhammad) may be free from blame (in respect of special privileges). God is forgiving, merciful. Postpone (? the turn) of whom you will of them (0 Prophet) or take to yourself whom you will of them. Whoever you desire of those you have set aside, it is no sin for you (to receive). That is better, so that they may be comforted and not grieve, and may all be content with what you have given them. God knows what is in (all) your hearts. God is knowing, clement. Women are not permitted to you after (this), nor may you exchange them for (other) women, even though their beauty pleases you, apart from what your right hand possesses. God is watchful over everything (33.50-2). Bu yazı, Prof. William Montgomery Watt’ın “Women in the Earliest Islam” (İslam’ın İlk [Dönem]lerinde Kadınlar) baslığı altında ve ilk olarak 1991’de yayınladığı makalesinin (bir kısmının) Türkçe tercümesidir. W. M. Watt’ın bu yazısının daha önceki bir Türkçe tercümesi muhtemelen bulunmamaktadir; bu sebeple yazının ilk Türkçe tercümesini sizinle paylastığımızı düşünüyoruz. 1999 yılında, Watt’ın 90. yaş gününde kendisiyle yapılan son röportajı (arkadaşı Bashir Maan ile birlikte) gerçekleştiren Sayın Alastair McIntosh’a, bu röportajı yaptığı gün kendisine Prof. Watt tarafından verilen bu yazıyı internet sayfasında (http://www.alastairmcintosh.com) paylastığı ve bizim de tercüme edip dergimizde yayınlamamızı hoş gördüğü için tesekkürü bir borç biliriz. Prof. Watt’ın bu yazısı aslen “Studia Missionalia” (Vol. 40, 1991, pp. 162-173, Editrice Pontificia Universita Gregoriana, Roma) adlı bir gazetede yayınlanmış; kendisiyle irtibata geçtiğimiz Sayın Alastair McIntosh bu gazeteyi “belirsiz (obscure) bir Vatikan gazetesi (journal)” olarak tanımlıyor. İslam hala bir çok yönden bir erkek dini, fakat kadınların konumu Muhammed ve onun duyurduğu din tarafından farklı noktalarda geliştirildi. Bu gelişimin erken safhalarını anlamak için Muhammed’in zamanından önce Arap Yarımadası’ndaki (Arabia) kadınların konumunu bilmek gerekir. Bunun icin kayda değer ölçüde Arapça döküman bulunmaktadır fakat tam bir resim elde etmek, işinin ehli antropologların daha ileri calışmalarını gerektiriyor. 1956’da yayınlanan Muhammed Medine (Dönemin)de (Muhammad at Medina) adlı kitabımda, bir antropolog olmasam da, yapabileceğimin en iyisiyle bu materyali ele almaya çalıştım. Bildiğim kadarıyla da o zamandan beri bu (konu) üzerinde çalışma yapan bir antropolog olmadı ve burada sunacaklarım benim kendi bulgularımın bir özetidir. Müslüman bir erkeğin 4 eş alabilmesine olanak sağlayan İslam Hukuku hükmü sıklıkla daha önceki sınırlandırılmamış çokeşliliğin (polygyny - çok kadınlılık) sınırlandırılması zannedildi. Erkeklerin on kadına kadar aldıkları bir veya iki olaydan bahsedilir, fakat bunun ne tür bir sosyal sistem içerisinde yer aldığı açık değildir. Sınırlamanın temellendirildiği Kur’an ayeti erkekleri birden fazla kadın almaya teşvik ediyor gibi görünüyor: “Eğer yetimlerin haklarını gözetemiyeceğinizden korkarsanız size helâl olan kadınlardan ikişer, üçer, dörder nikâh edin ve eğer bu surette adalet yapamayacağınızdan korkarsanız o zaman bir tane veya milkiniz [kendinize ait bir] cariye alın…”(Sure 4:3). Bu ayeti anlamak için İslam öncesi Arap Yarımadası’ndaki kadın-erkek arası ilişkileri (hakkında) şöyle etraflıca bir açıklamaya girişmek gerek. Temel olgu Arap Yarımadası’nın coğu bölgesinde sosyal sistemin adeta yalnızca anaerkil (matrilineal) yakınlığın, yani sadece annenin soyundan olanların yakınlığının (akrabalık - kinship) dikkate alındığı şeklinde görülüyor. Bu, tabii, anaerkillik (matriarchy) veya kadınların yönetimi anlamına gelmiyordu. İnsanların anaerkil bir bağla birbirine bağlı geniş ailelerinin olduğu görülüyor fakat bu ailenin ve mülkiyetinin kontrolü (en) büyük kız kardeşin ana bir erkek kardeşinin ellerindeydi, ve bu erkek kardeşten onun (büyük kız kardeşin) oğluna intikal ederdi. İlk (dönem) Müslüman alimleri bu sosyal sisteme ait evlilik düzenlemelerini (eserlerinde) muhafaza ettiler. (Bunlardan) ikisi, sınırlandırılmış ve sınırlandiırılmamış çok kocalılık (poliandri) olarak adlandırılabilecek formlar olarak görünüyor. Böylelikle, kadının sınırlı veya sınırsız sayıda koca aldığı bir durum vardı, erkeğin bir kaç kadın aldığı değil. Sınırlı çok kocalılık durumunda, bir kadın bir cocuk doğurduğunda, erkek cinsel partnerlerini (ki bunlar on kişiden azdırlar) bir araya toplar, onların önünde onlardan belirli birinin çocuğun babası olduğunu açıklardı; ve (o) adam bunu reddetmeye izinli değildi. Sınırlandırılmamış çok kocalılık ise, öyle görünüyor ki, fahişelikten (prostitution) ancak şöyle böyle ayrışıyordu, fakat hakkında bilgilendirilmediğimiz kısıtlamalar olmus olabilir. Bu (gibi) cok kocalılık durumlarında “evlilik”in anayerli (uxorilocal) olduğu görünüyor, yani (evlilik) kadının yaşadığı yerdeki evde vuku bulurdu; ve erkeğin (de) kadını “ziyaret” ettiği söyleniyor. Erkekler (de), şüphesiz, aynen böylesi “ziyaretler”i bir kaç kadına yapıyor olmuş olabilirlerdi. Bununla birlikte, ilaveten görünen o ki Arap Yarımadası’nın başta Mekke olmak üzere bazı bölgelerinde anaerkil sistem yerini ataerkil olana bırakma sürecindeydi. Baba tarafına (paternity) olan bu ilgi muhtemelen Mekke’deki artan ticari refah ve beraberindeki bireycilik (individualism) gelişimi ile bağlantılıdır. Kayda değer ölçüde kişisel servet yığan adamlar bunun, öylece kız kardeslerinin cocuklarının geniş aileleri tarafından değil, öz be öz kendi çocukları tarafından miras alınacağından emin olmak istediler. İslam tarafından yapılan (en) temel değişikliklerden biri kadının aynı süre zarfında sadece bir erkekle cinsel münasebet halinde olması gerektiği konusunda ısrar etmesiydi.Boşanma veya eş değiştirme nisbeten daha kolaydı, özellikle (de) erkek için; fakat kadının başka bir cinsel partner edinmeden evvel hamile olup olmadığından emin olmak için bir bekleme süresini (iddet) gözetmesi zorunluydu. Böylesi (köklü ve geniş) toptan bir değişimi tümden bir defada etkin kılmak elbette ki kolay değildi ve bir süre için bu bekleme süresini gözeten ve gözetmeyen kadınlar arasında bir ayrım yapılmış olduğu görülüyor. Bu değişimle kol kola bir değişim (daha) süre gitti; anayerli evlilikten atayerli (virilocal) evliliğe; yani bu durumda başka bir eve gidecek olan kadındı ki bu ev erkek tarafından temin ve tedarik edilecekti. Muhammed’in eşlerinin her birinin ayrı dairesi (oda - apartment) vardı, fakat bunlar, bir camii görevi görse de esasen (onun) kendi evi olan merkezi bir avlunun etrafındaydılar. Yukarıda alıntılanan Kur’an ayetinin 625 yılında vuku bulan ve bir cok Musluman’ın öldürüldürüldüğü Uhud savaşından sonra vahyolunduğu söylenir ki (bu savaş)geride temin ve tedariklerinin sağlanması gereken dul kadınlar bırakmıştı. Medine’nin (bu) zamanındaki şartlarında bu dul kadınların bir çoğu orada yaygın olan çok kocalılığa geri batabilirlerdi; ve şüphesiz ki bu sebepten Müslüman erkekler, icinde sadece hane reisine eş olmus bir kaç kadının bulunduğu bir ev halkı şekillendirmeye teşvik ediliyordu. Kur’an aynı zamanda anaerkil ev halkının başındaki erkeklerin kendi (sorumlulukları) altındaki kadınlara adaletsizce davranmalarını engellemek için tasarlanmış farklı diğer düzenlemeleri de içerir. Toplumun bu yeniden yapılandırmasında kadınların konumunda değişiklikler vardı, bir kısmı daha iyiye, bir kısmı belki daha kötüye, fakat tabii kadının çok kocalılık sisteminde (kendisini) nasil idame ettiğini gerçek (manada) bilmiyoruz. Bununla birlikte, bütün olarak ele alındığında, kadınların (bu) değişimlerden istifade ettikleri ve (kendilerine) çok çok daha iyi güvenlik sağlandığı görülür, özellikle de komünal toplumdan, daha bireyci bir topluma dönüşümün kaçınılmaz olmuş olması hasebiyle.